As you probably know if you’ve been reading Swoon Worthy for any length of time, it’s that we love our animals. We have two cats and one dog and the house is basically a little crazy at all times. They are very much like our children – sometimes loveable, often times hilarious, sometimes badly behaved and most of the time a pain in the backside. Yeah, we love them anyway. However, trying to keep a fairly ‘nice’ home and still be able to have pets has proved challenging at the best of times. 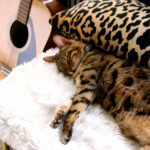 I never had my own pets as an adult until moving in with Wayne and his two cats – Pablo, who is now our little old guy at 12 years old and Senna who sadly passed away a few years ago. My friends warned me, “Are you sure you want to move in with two cats? There will be hair everywhere! !” Ahh yes, love is blind, eh? I moved in anyway. Once Senna was gone, we felt the emptiness in the house and realised we were definitely a 2-cat household. 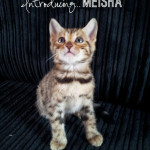 So we brought home Meisha, our completely insane Bengal who I love despite driving me nuts on a daily basis. A couple of years later, I was finally working freelance and based at home so we decided to round off the family with a dog. 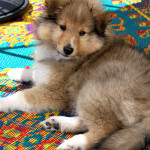 Enter Quito, our Shetland Sheepdog. Now, I’m not going to tell you that you can’t have a nice house and have pets too. Of course, it’s going to be a lot easier to keep things clean without them (again, no different really to children I imagine) but it just requires a little diligence in terms of ensuring things don’t get out of hand. Pablo clearly has no issue with mess. Also, how is that possibly comfortable?! I admit, keeping everything tidy was easier with two cats. Once we introduced the dog, things got a little crazy. Anyway, here is what I learned about keeping a clean house and still allowing your animals to well, act like animals. I always have a pair of these handy because they are perfect for removing hair from furniture and soft furnishings. Simply don the glove and rub in one direction on the fabric. The hair will easily start to ball up, making it a cinch to remove and throw away. While the dog is allowed on the sofa, he’s not allowed on our bed. However, the cats are. I know it seems mean but it’s cramped enough when both cats are trying to sleep with us, never mind an 11kg dog as well. We had to draw the line. Plus, aside from a bit of shedding, the cats are actually incredibly clean while the dog couldn’t care less about jumping around with mucky paws. So on my white bedding, he is absolutely not allowed. Start them very young so they know where they are invited to be and where they are not and ensure you always enforce it. * If your other half loves a cuddle with the dog in bed and you are insistent he is not allowed, the dog is going to get mixed messages. Determine the no-go zones before you invite the pet into your home and stick with it. *Clearly dogs are easier to train than cats. While Pablo knows he’s not allowed on the counter tops, I have tried literally every suggestion out there to keep Meisha from doing the same. It doesn’t work. She will still get up there when I’m not looking. Could you say ‘no’ to a face like that? Saying that, we use throws everywhere in the living room because we enjoy a bit of a snuggle with the animals when we’re watching TV. I rarely get to see my ‘naked’ sofa anymore sadly (and when there are no throws, the door is shut) but at least I know the fabric is still in good shape underneath. I want to eventually get a throw that matches the colour of my sofa exactly to make it less obvious but obviously, you can just find something that works with your decor. I remember reading a quote from a designer who said they get an extra cover for the seats made up of the same material as their sofa that’s removable and cleanable because they had dogs. I always thought that was a nice (if pricey) option too. We use a baby gate at the bottom of the stairs to keep Quito in “the zone” we wish him to be in. Meisha’s territory is the upstairs, Pablo loves hanging out in the finished cellar. Quito tends to spend most of his time on the main floor with us. They all have their own areas (the cats obviously choosing their own) and it allows them all to live separately but peacefully. Obviously they all spend some time in each other’s company too but there’s always somewhere they know they can retreat if they want to get some peace and quiet. Also, the cats’ litter tray and food are kept in the cellar (which is finished and heated, we’re not sending them into some dungeon, I promise). Quito is obsessed with both and so having a cat flap on the door to the cellar means the cats have full access and Quito does not. It also means the cat ‘paraphernalia’ is not in the main living areas of the house which keeps things a little cleaner. I realise not everyone will have a cellar so designating a small area for kitty things with floors that are easier to keep clean is always best – consider the bathroom, kitchen or utility areas as alternatives. Quito’s dog bed is in the dining room (it’s not pretty but well, what can you do – I might find him a nicer one that I don’t mind leaving out). We moved his crate to my office when while we were doing the dining room remodel and I may just leave it there as it’s out of the way. He only really sleeps in it at night or goes in when we are out so it makes sense that it’s not in the main part of the house anymore. Again, I realise not everyone will have this option if you are crate-training so finding an area out of the way is not always possible. It is what it is! We have two vacuums that we use all the time. A large Dyson and a small handheld Dyson. Keeping the vacuum in an area where it can easily be grabbed means we hoover every single week (more lately as Quito is shedding and his hair is everywhere!) and the little hand held is great for removing any cat hair on the bed between washings. If the hoover is left in the cellar, for instance, I feel really lazy about going down and dragging it up to the main floor. If it’s in the main cupboard, I find I have less excuse to not pull it out when the house needs a tidy and that just means the house stays cleaner because I’m doing it more often. We used an eggshell finish in the dining room and already I’m seeing the benefit of this. Any dirty marks easily wipe clean with a damp cloth. The white matt finish in the kitchen? Not so much and the difference in terms of sheen is negligible. When I’m ready to repaint, I’m going to again use an eggshell finish to make it easier to keep clean without having to repaint each year. Lifesaver. More for cats than dogs but I love using velvet fabrics. 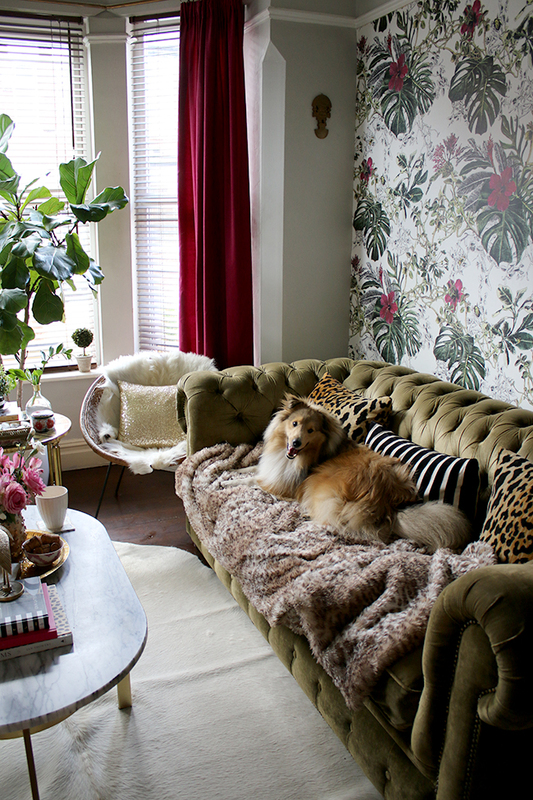 My main sofa, my smaller settee and my headboard are all velvet as are the curtains in my living room. Not only does it look good, the cats don’t touch it. Reason? Velvet is not a looped fabric. This means the cats can’t get their claws in it to tear it to shreds. 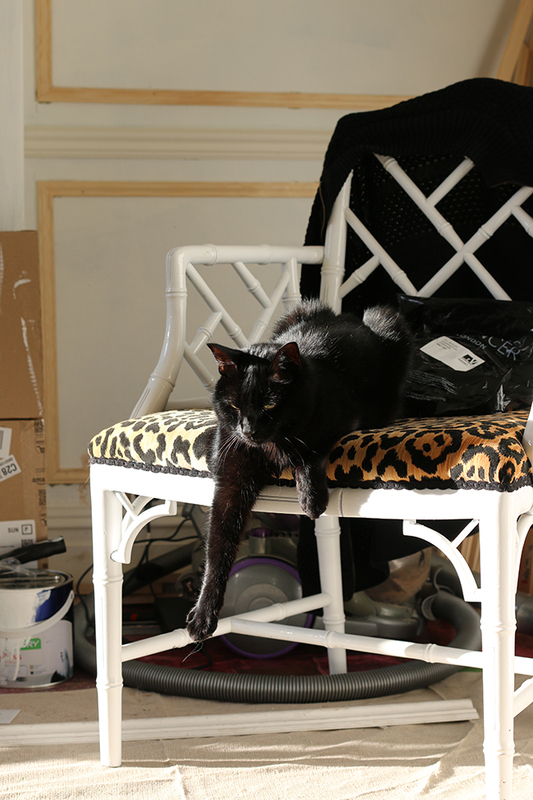 The whole reason they are making a mess of your fabric sofa is because it’s so handy for getting their claws in those loops and pulling, shedding the top layers which keep them sharp. Without the loops, the cats have nothing to hook in to so they don’t bother messing with it. If you have pets, it’s probably not the wisest idea to have carpets in my experience. I know this country can get ridiculously chilly and so carpets are still a popular choice but they will hang on to stains (yes, animals have accidents when they have eaten the wrong thing and yes, cats like to vomit to rid themselves of hair balls) so harder surfaces are a million times easier to keep clean and wipe up any accidents when they happen. The other problem with carpet is that it absorbs smells and I don’t care what they say about enzymatic cleaners (I’ve used them all), once an animal marks a spot, they just know to keep going back to it. Eradicating that from a carpet is nearly impossible in my experience. Make your life easier and skip the carpet and use area rugs instead which are easier to spot clean. If you are insistent on getting carpet, then consider carpet tiles which can easily be replaced when things go wrong. Also? If you aren’t opposed to cowhide, then I strongly recommend it. They are virtually indestructible and so easy to keep clean. Yes, there are animals in my home. That means that there are animal hairs about, there are dog toys strewn around the floor at any given time, there’s probably a cat on our bed, I’m forever disinfecting the counters and the dining table, there are little paw prints in the bathtub because for some reason Meisha likes to hang out in there and yes, I have do a 5 minute tidy up every evening before I go to bed. There comes a point where you do your best to keep on top of it but at the end of the day – these are signs of a lived in home. I am no longer obsessed. It’s a home that’s filled with animals that we love, that entertain us endlessly and that we couldn’t see ourselves without. And sometimes, you just have to realise that things aren’t always going to look perfect and that’s okay. 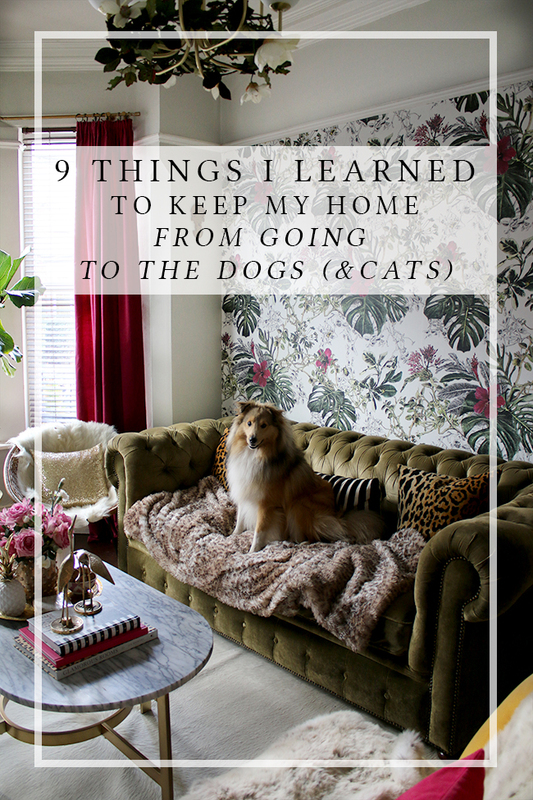 What do you do to keep your home from going to the dogs and cats? Any tips you can share? Couldn’t agree more with all of that – we have three dogs and a cat and you’re constantly cleaning up pawprints/hair/toys up. Still wouldn’t want it any other way! 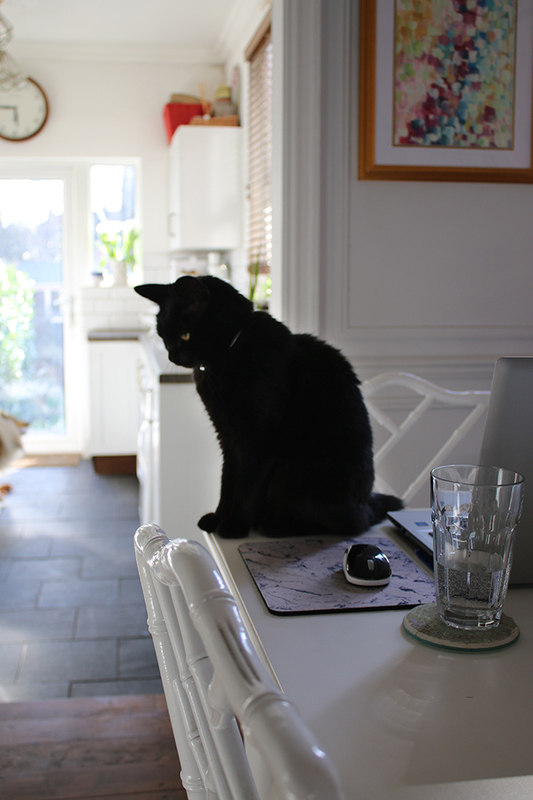 The dogs aren’t allowed upstairs (babygate :) ), whereas the cat goes wherever he wants – but as you said, he’s a lot cleaner! First thing we did when we moved in was get rid of all the carpet and have the wooden floorboards sorted. We also replaced our wood dining table (inherited) with one with metal legs as one of our dogboys kept marking one of the legs. We hoover and mop the downstairs every week and always have a little handheld hoover at the ready. Some great tips here! Many of our customers swear by using fragrance lamps in their home to get rid of any pet odours. As well as providing a gorgeous fragrance that lasts ages, they also cleanse the air in your home from any bad smells (also brilliant for strong cooking smells like curry or burnt toast, paint, even stale cigarette smoke). We have a white kitchen floor (we’re changing it as soon as we can) but 99.9% of the time covered in muddy paw prints, there are toys everywhere (some of them in various states of destruction) and I found the puppy eating a pen on the bed the other day so the sheet got covered in ink (it’s a good job he’s cute). Oh and we have what we affectionately call ‘puppy prison’ in the corner of the dining room, where the crate (which has a lovely home made cover on it to not look so awful) is attached to a homemade pen area for containing the littlest monster, but we’re getting rid of that soon so that’s a plus. I’m going to try the rubber glove trick this weekend though. That sounds great! I am primed for the full dining room reveal but this floats my boat too Kimberly. We share our home with a cat, two Belgian Shepherds, a Collie and an elderly JR terrier. The Belgians are big girls and full on dogs. My life savers are two vacuums as our home is now over four levels and carrying the machine to and fro would kill me, and a dedicated dog washing machine. The Shepherds also wear a fleece coat in the car after activities, they are Equifleece and wick water from their coats.Washing the vetbed bedding weekly or more keeps dog smells to a minimum. My final tip is having converted the loft we have kept this area dog free and therefore hair free. I can go up there for a break and get on my yoga mat without the ordeal of hair removal first, its a gift at the end of a hard day in the life of a dog trainer. We have three pugs and also foster for a rescue so things do get crazy at our house. We put in a dark wood laminate floor in the kitchen and no more puppy prints everywhere. I can’t wait to rip up all the carpet, but for now we bought a high end carpet cleaner. Best investment ever! We keep the two white loveseats covered with sheets. That way, if someone comes over, I just whip those off and everything looks great. I do let the pups sleep with us, they always have. I just change our bedding more often. Thanks for this post, I love these tips! I’m definitely going to use the rubber glove idea. We recently adopted a cat and I can’t keep him off the counters to save my life :) And he’s wild at night… All cat tips welcomed :) Have a great day friend! On a more general practical note, I keep a big lidded bin with compartments next to my covered litter tray containing rubber gloves, loo roll, double sheets of newspaper, fresh litter, dustpan & brush and animal friendly baby wipes and spray cleaner so that I can deal with any mess/potential pong (!) more or less immediately. 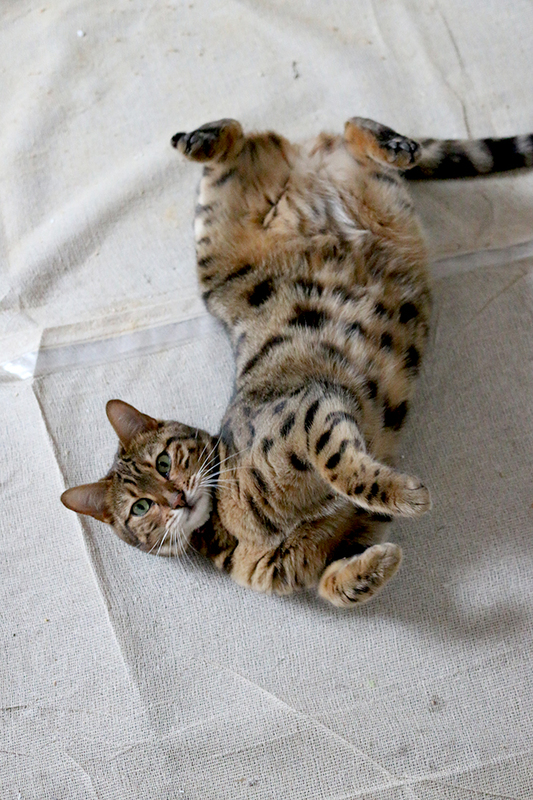 I have in the past just used a lidded wicker basket – useful too for cat scratching! Someone asked for a recommendation for a vacuum cleaner: the Miele Cat and Dog is recommended by Which as the best for pet hair. I bought one and it has made vacuuming up pet hair infinitely easier! yes, I second all of that. I know there’s a trade off with my animals, but I love them and cannot imagine a home without them. To keep my kitties off the counter or away from anything — I use double sided tape. :) They hate the feeling, but it doesn’t hurt them. I’ve put it on the corners of chairs, lounges, counter tops. It’s worked great and gives us a giggle to see them touch it when they’re learning. They seem to remember it long after I remove the tape. I know exactly what you mean about cats and countertops. They know they aren’t allowed on them so they don’t do it in front of me but I frequently find little paw prints on them so I know they go on them when I am not home! Great tips here, thanks for sharing. Your fur babies are SOOO beautiful!! Great tips here! We’re likely going to get a dog in the future, when the kids are a little older and I’ve recovered from the chronic sleep deprivation that I am going through now, and when we’ve completed the house extension + renovation. I’m sure I’ll be coming to you for advice! 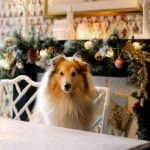 From one Sheltie lover to another: Swiffers were my life-saver when we lived in a large, old historic home with its original heart pine floors. I had oriental rugs everywhere that I vacuumed frequently with a Shark Pethair…..something or other…which is wonderful. The I used the Swiffers to get up the dog hair that clings to the baseboards. My other tip re doggie care – send them out to be dry-cleaned (as my late, very funny MIL called it!). Groomers can get to the second undercoat far better than we can at home and it made a big difference in shedding season. Also, I used painter’s drop-cloths on whatever piece of furniture that they chose as their “own” – and, as I have purchased most of my furniture at estate sales and have them slipcovered, I could wash them whenever. But that is not always fool-proof with dogs. Maddie, a blue merle, loved to run her nose along the cording on the 8′ long, heirloom yellow brocade sofa in the living room on a regular basis! 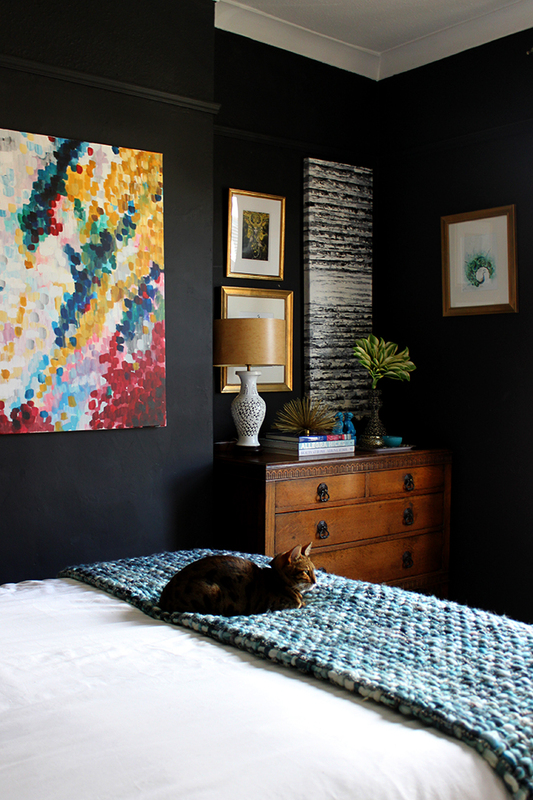 Kimberley – love this piece, I just have one cat but he does make himself comfortable wherever he fancies – he can actually open the sliding door of our wardrobe and get in there under the clothes rail! A question, you said you used eggshell paint in your dining room, do you mean on the walls? You could really add “kids” into your title cos this advice is perfect for that too! :) I swear by throws, handy hoovers and wood floors. I would love to give a cat a home, but I’m thinking the poor thing would be terrorised with my grabby kids running around here, so maybe in a couple of years when they’re a bit more civilised! As always, I love visiting your blog. With cats that stay inside in winter, everything is fur covered. But it is worth it for purrs and cuddles. 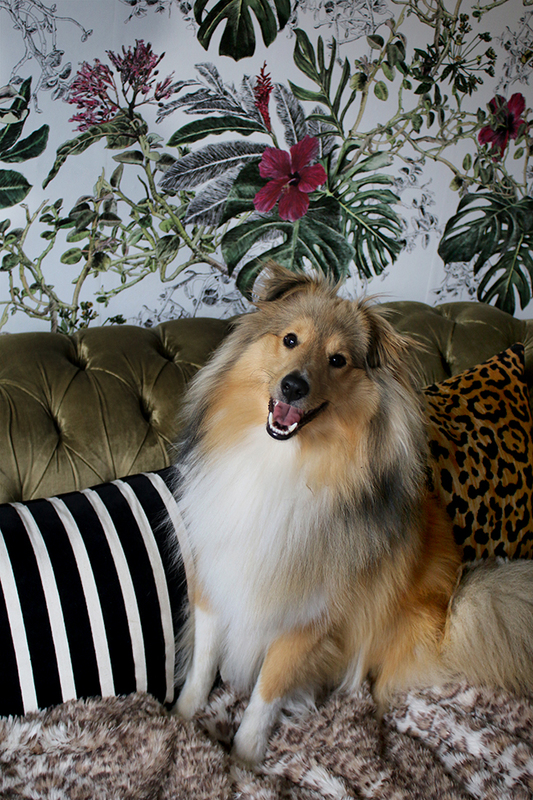 Quito is the cutest sheltie i have seen in ages. As a northern Canadian, I love all the color in your blog. Thank you for sharing your home with us. What beautiful photo ‘s! Thank you for a great read, including the comments. My cat has literally just put holes in my bedspread. But she looks so happy massaging the bedclothes. So no more looped materials for me. I use duvets and covers for the dog baskets as there thicker than the dog beds but washing and drying 2x 13tog double duvets and covers takes all day. We will also be putting down hard floor. I bought a cheap brown carpet for the Hall way for after dog walks, however it actually holds hair. I’ve never had a carpet like it. I’ll be getting down on my hands and knees wearing rubber gloves shortly to see if that helps. Oh my tip: for pet accidents try non bio washing liquid. It neutralises better than Bleach. Weird but true. It’s a very lovely story. After reading these two articles I can definitely tell that to have a pet is always better than haven’t. Even if with a pet there is always more homework than without. The best advice I have ever had about having a pet (cat) is the last one on your list: learn to let it go. Accept that you will have cat hair on your clothes, that you will wipe your surfaces more often and in my case at least, I have to live with a cat tree in my living room. It keeps my furball happy and away from doing his claws on my sofa. I even managed to find one that didn’t look too horrible (what’s with the beige carpeted cat tree???) Thanks for this post and all the others. I love your posts! Weird question: in the photo above of the black room with the cat on the bed, I can see a corner of a painting by Kupka callled Cosmic Spring. I’ve been looking for a copy of this for 10 years! Do you know where it was purchased? Thanks for any info you can give me!! Beautiful home! Would you mind sharing the name and brand of the black paint you used in the room with the cat on the bed? Thank you! 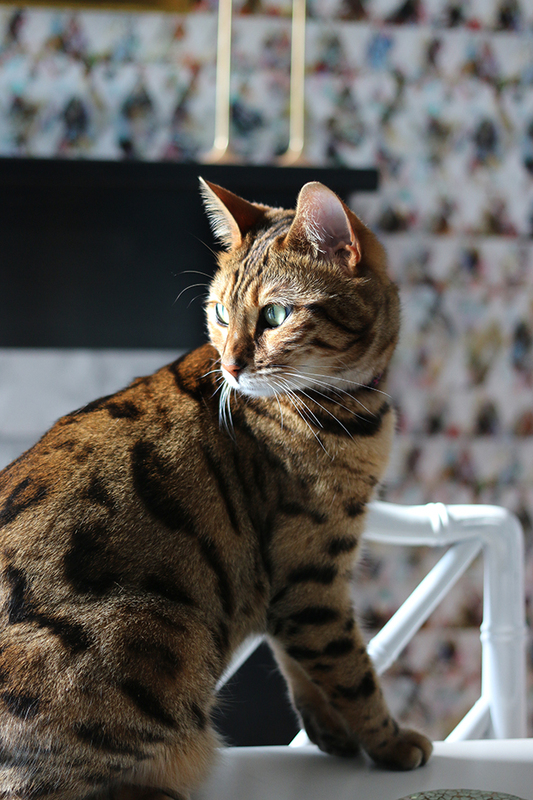 I know others have mention it, but the pictures of the cats are stunning! What beautiful cats! !